30 pages of puzzles, true or false, fill in the blank, match a name with a place, and word games. Each problem gives Bible verse needed to find answer. 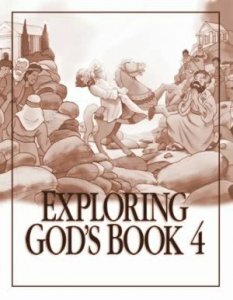 EXPLORING GOD'S BOOK 4 provides Bible study lessons when combined with listening to DELIVERED! Volume 7 and VICTORIOUS! Volume 8. The workbooks include charts, word games, Bible texts, puzzles and codes that reinforce the audio Bible stories. Homeschoolers praise this excellent resource and teachers of Bible curriculum tell of success using this teaching aid to learn about scripture and biblical principles. 30 copies may be printed for use in a classroom, Sunday School or homeschool curriculum. After confirming your order in the checkout process, click the "workbook download button" to start downloading the workbook file.